Beloved Spear: The Word "Tragedy"
The images of the scattered, burning debris of Malaysian Airlines Flight 17 were still fresh, and the fires were still burning, as the first words describing the event were put out there. And for some reason, a single word--or the nuance of the meaning of that word--just felt wrong. A "tragedy," they were calling it. "Tragedy." That was the word from the White House. That was the specific word used by Vladimir Putin. That was how Fox News described it, and CNN. "Tragedy." And it was tragic, in the most rudimentary sense of the term. Hundreds of dead, meaning thousands and thousands in mourning. Here, scores of lives that were promising and full of potential, now ended. In that, it is immensely sad, and a somber thing. But tragedy has other connotations, deeper and more complex ones, and that's where the word seems to break down for this terrible event. Classical tragedy, of course, is a narrative form that revolves around fate and human hubris. A person has a single abiding flaw, one that is typically woven up with their greatest strength. Their pride. Their strength of purpose. Their passion. Their love for one another. Their commitment to their promises. Their desire to return home, having proved themselves worthy by killing bullies and oppressors just like dad used to do, and finding a wife who reminds them of dear ol' mom. Their calculating, world-weary cynicism. In a tragic narrative, that flaw destroys them. But those who died yesterday had no such flaw. In that classical sense, their deaths were not tragedy, not quite. Tragedy weaves up deeply with the idea of fate, of an unchosen, inexorable destiny. When an accident of fate places human being in harm's way, it is tragedy. It is tragic, for instance, when thousands die because they happen to be small living things in the path of a tsunami or a tornado. When a beautiful spirit succumbs to cancer, that is tragic. But all of those deaths yesterday were not tragic, not completely. They were chosen. It was a choice that they should die. A group of soldiers have been placed into a disputed region by a singularly calculating tyrant, who masks his involvement there behind a thicket of lies and subterfuge. Operating in secret, they are equipped with a sophisticated weapons system, which they use to target a passing aircraft. Their intent was to destroy that aircraft, and to kill all of the people on board. That was precisely what they did. Oh, sure, they weren't the people they'd intended to kill, any more than that gangbanger intends to shoot the little girl when he sprays gunfire from a passing car. 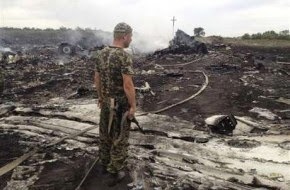 They believed it to be a transport plane, although no Ukrainian transport craft looks even vaguely like a 777. Soviet-era radar guidance may not be quite so discerning, though. And so they shoot down the plane they tried to shoot down. They kill hundreds of Dutch, Australian, and Malaysian human beings, where they hoped to only kill dozens of Ukrainian human beings. This is not tragedy. It could be tragedy, but it is not yet. Tragedy comes with awareness of the reality of what hubris has wrought. It is Othello, realizing he has killed his faithful Desdemona. It is Juliet, awaking to her dead Romeo. It is Oedipus, tear-filled eyes wide with horror, the needles clutched in his hands. It is the smell of the smoke in Jephthah's nostrils. It is Eugene Onegin, seeing Tatyana's beauty too late, with new eyes. I do not doubt that some of the men involved this morning feel that sense of tragedy, as the images of families and children from that flight play through the world's consciousness. Those men may or may not be allowed to express their pain. When you are acting covertly and in secret, agents of a power that wants your involvement in a conflict kept hidden, your ability to express regret is limited. I am not sure that existential knowledge of the meaning of tragedy yet rests behind the cool, precise eyes of Vladimir Putin.